* This is my article in BusinessWorld on March 24, 2017. The current tax reform proposal of the Duterte administration promises to improve the Philippines’ competitiveness mainly by reducing income tax rates and cutting exemptions in value-added tax (VAT) and other fiscal incentives. The proposal has somehow created three myths in taxation. 1. REDUCING THE INCOME TAX RATE CAN LEAD TO REVENUE LOSS. No, for two reasons. (a) The Laffer Curve is a good reminder that tax revenues can go down as tax rates increase. High taxes are disincentives to honest business and that is why many companies are hiring good law and accounting firms to either take advantage of legal loopholes and reduce tax payments, or find technicalities bordering on dishonest tax payment. And (b) Hong Kong and Singapore are good examples that low income tax rates do attract more local and foreign businesses, which further expand the tax base. 2. THE NEED TO RAISE EXCISE TAX FOR VEHICLES AND OIL PRODUCTS TO COMPENSATE FOR REVENUE LOSS IN INCOME TAX CUT. No, for two reasons. (a) Vehicles and oil products are necessary for more business creation -- petroleum is a public good, after all. Petroleum allows huge trucks, buses, airplanes, and ships to transport more people and goods, activities which again expand the tax base; and (b) raising the oil tax (by P6/liter across the board) further raises the cost of doing business in the country. In the table, the Philippines is third highest in tax payment as percent of commercial profit. While the taxes on profit and corporate income is comparable to many of its neighbors, its “other taxes” like VAT, documentary stamp tax, franchise tax, capital gains tax, excise tax, etc. charge high rates. So raising the excise tax on vehicles and oil products is a raise on “other taxes” and that will dent the attractiveness of lower income tax. 3. NO NEED TO LOWER VAT, JUST REDUCE THE NUMBER OF EXEMPTIONS. No. For two reasons: (a) Many industries and sectors have succeeded in their lobby for VAT exemption precisely because the 12% is high; and (b) among ASEAN countries, the Philippines, at 12%, has the highest VAT rate%; five countries have only 10% (Cambodia, Indonesia, Laos, Thailand, and Vietnam), Singapore 7%, Malaysia 6%, Myanmar 5%, Brunei 0. 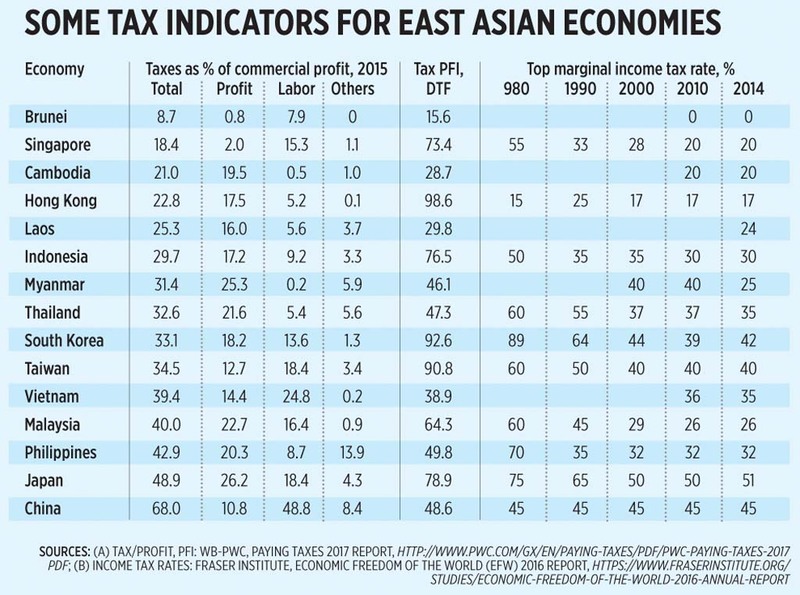 See the column on tax post filing index (PFI), distance to frontier (DTF), 100 being the highest score. The Philippines has a low score of 49.8 mainly due to VAT non-refund policy. Economies with scores of 63 and above either do not have VAT or have VAT but have low compliance time with paying their corporate income tax (CIT) (see table). So a good compromise will be to bring the VAT back to 10% and remove all exemptions except for raw agricultural and fishery products. Another observable point from the above numbers is that many countries in Asia (and other continents) were socialistic in their income tax policy, started after World War II until the 1980s. For instance in 1980, Malaysia, Thailand, and Taiwan have income tax rates of 60%, Philippines has 70% and South Korea has almost 90%. The faster pace of globalization from the late 1980s onwards made many governments realize that the Laffer Curve indeed is correct, that the higher the tax rate, the lower will be the business activities and overall tax revenues. To plug endless fiscal irresponsibility also known as endless and yearly budget deficit that require endless search for higher taxes, certain public spending and subsidies must be cut and certain government offices and bureaucracies must shrink or be abolished. Governments should learn to live within their means, even live below their means, especially during years without crises so they can have fiscal surpluses and pay their ever-rising public debt stock. Bienvenido Oplas, Jr. is the head of Minimal Government Thinkers and a Fellow of SEANET. Both institutes are members of EFN-Asia.